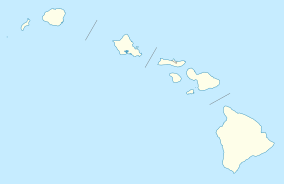 The Northern end of the trail is in Upolu Point in the North Kohala District at the Moʻokini Heiau, coordinates 20°15′28″N 155°52′37″W﻿ / ﻿20.25767°N 155.87707°W﻿ / 20.25767; -155.87707. A part of the trail called Ala Loa (meaning "long trail" in the Hawaiian Language, another name for the same network of trails) was added to the state registry of historic places as site 10-10-11,334 on January 14, 1989,  and to the National Register of Historic Places as number 87001127 in 1987. This runs from Kiholo Bay to Kalahuipauaʻa near Puakō. ^ "Ala Kahakai National Historic Trail". Geographic Names Information System. United States Geological Survey. Retrieved 2012-04-03. ^ "Sen. Hirono Secures Important Hawai'i Priorities". Big Island Now. February 12, 2019. Retrieved 2019-03-19. Wikivoyage has a travel guide for Ala Kahakai National Historic Trail.